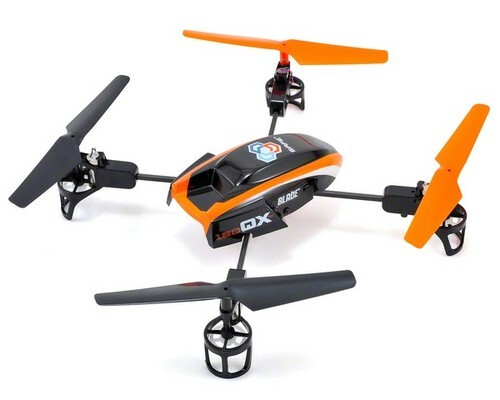 Here you have an E-Flite BLH7480 Blade 180 QX HD BIND & FLY Ultra Micro Electric Quad Copter !! This package will include the Heli, 3.7 Volt 500Mah Li-po Battery Pack, Charger, Camera And Owners Manual. Please understand that this sale includes the complete ARF E-Flite Quad-Copter Heli, Original Battery Pack, Charger, Camera, Owners Manual And Original Protective Storage Box. You can't go wrong here when you will receive an E-Flite heli, you have a Low Purchase Price Of Only $144.00 and if you buy it now you can receive it in just a "few days" !!! The Blade® 180 QX combines the latest in quadcopter innovations with HD video and image capture capabilities. Utilizing SAFE™ technology, the 180 QX maintains superior stability in three flight modes. With the included E-flite® EFC™-720 camera, pilots can experience aerial video and image capture by simply activating the triggers on a Spektrum™ 5+ channel transmitter after programming it. Ideal for both indoor and outdoor flight, the 180 QX is a personal eye in the sky from the experts in Heli excitement. With the included EFC-720 flight camera and a 2GB micro SD card included, 180 QX HD pilots can capture video and still images while flying. This intuitive camera can be activated at any time during flight and be switched seamlessly between video and still image capture. This functionality can be programmed into a compatible DSMX® 5+ channel transmitter.